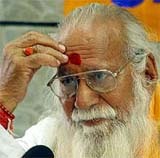 Senior Vishwa Hindu Parishad leader Giriraj Kishore, who was actively associated with the Ram temple agitation, died in New Delhi Sunday evening following prolonged illness. He was 96. “He was ailing for some time now. He died peacefully at the VHP headquarters in R K Puram at 9.15 pm,” VHP Delhi unit spokesperson Vinod Bansal said. Giriraj had joined the RSS at an early age and was one of its senior most ‘pracharaks’. The Sangh had sent him to VHP. A bachelor, Giriraj Kishore, was wheelchair-bound for the last several years. He had recently pledged to donate his body for social cause.